(27 Jul) Gujarat’s new compulsory reading list for government primary and secondary students doesn’t just seek to educate students on “facts” about India’s culture, history and geography. It also has its own take on science, particularly landmark inventions. “. America wants to take the credit for invention of stem cell research, but the truth is that India’s Dr Balkrishna Ganpat Matapurkar has already got a patent for regenerating body parts.. You would be surprised to know that this research is not new and that Dr Matapurkar was inspired by the Mahabharata. Kunti had a bright son like the sun itself. When Gandhari, who had not been able to conceive for two years, learnt of this, she underwent an abortion. From her womb a huge mass of flesh came out. (Rishi) Dwaipayan Vyas was called. Tejomay Bharat “We know that television was invented by a priest from Scotland called John Logie Baird in 1926. But we want to take you to an even older Doordarshan. Indian rishis using their yog vidya would attain divya drishti. There is no doubt that the invention of television goes back to this. In Mahabharata, Sanjaya sitting inside a palace in Hastinapur and using his divya shakti would give a live telecast of the battle of Mahabharata. to the blind Dhritarashtra”. – Page 64 “What we know today as the motorcar existed during the Vedic period. It was called anashva rath. Usually a rath (chariot) is pulled by horses but an anashva rath means the one that runs without horses or yantra-rath, what is today a motorcar. The Rig Veda refers to this.” – Page 60 The 125-page book, Tejomay Bharat, that these passages are excerpted from was recently mandated as supplementary reading by the Gujarat government for all government primary and secondary schools. Published by the Gujarat State School Textbook Board (GSSTB), the book seeks to teach children “facts” about history, science, geography, religion and other “basics”. 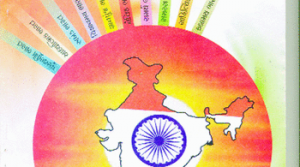 Tejomay Bharat is to be distributed along with eight books written by Dina Nath Batra, a member of the national executive of Vidya Bharati, the educational wing of the RSS. Batra’s books, translated into Gujarati and published by the GSSTB, have also been mandated as supplementary reading by the state government. Each of these books carries a customised message from Narendra Modi, as then chief minister, while Batra’s books praise him and the GSSTB. Tejomay Bharat carries a message from Modi praising the GSSTB for republishing the book. The book has . chapters such as Adhyatmik Bharat (spiritual India), Akhand Bharat (undivided India), Vigyanmay Bharat (scientific India), and Samarth Bharat (competent India). The book’s content advisor is Harshad Shah, vice-chancellor of Childrens’ University in Gandhinagar who was Gujarat chairman of Vidya Bharti till 2006.